In this age of constant digital inputs if you ask a young person what the term games means, their answer will most likely be about computer games. The fact that people can play fun and exciting games without a digital device is often quite surprising to them. The additional fact that they can play games with a group of people all in the same room may also be a foreign concept. They will know about team sports. But possibly not about team games. The novelty of adding non digital games to your team building program can add interest and anticipation into the sessions. Participants will look forward to the next game – e.g. what will it be, how might I achieve, what new way to have fun will I discover. This will help to motivate them to pay attention to the sessions so that they can complete their work and then move onto another game. The down side of being novel is that there will be a certain amount of inertia to overcome to get started in the first game. But once the inertia of trying something new has been overcome, the excitement of playing the game with their team mates will take over. cles are not being used enough. Low tech games at least require getting out of the chair and generally require a lot of movement. Since researchers have linked movement with learning in so many ways, low tech games will be helping the participants to learn, have fun plus focus their attention on the rest of the program. Face-to-face communication seems to be a dying art form. The closest digital equivalent is Skype, FaceTime and other forms of video conferencing. All non-digital games require some form of face-to-face communication. It may be verbal or non-verbal or a combination of both. It may even require some writing or sharing of symbols. The more your participants communicate with each other the greater their skills will become in the various forms of communication. to let the creativity of the group modify the game or the leader to add variations on the spot. Playing games without computers may be a dying art but it is one worth preserving. 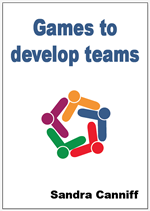 Why not add some non digital games to your team building program and see the difference they can make.